Approval of 21st Century Fox’s proposed takeover of Sky is likely to come in the first half of 2018, the company said on Wednesday, in a sign it is gearing up for wider review of the merger. Fox had hoped to close the deal in 2017 but it has been delayed by regulators. It follows concerns a deal would give the family of businessman Rupert Murdoch too much control over UK news. US-based Fox already has a minority stake in Sky. Both Sky and Fox are controlled by Mr Murdoch, who also owns the Times and the Sun newspapers. 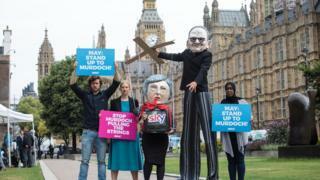 Fox is seeking to buy the 61% of Sky it doesn’t own. In June, Culture Secretary Karen Bradley said she was “minded” to refer the almost 12bn (9bn) deal to the Competition and Markets Authority (CMA) for wider review, based on the risks to media plurality. This week, she asked Ofcom for clarification about parts of its investigation of the proposal, extending the timeline for her decision to the end of August. The request came after a lawsuit was filed in the US, alleging false quotes had been inserted into a Fox News story that was coordinated with the White House. Fox, which later retracted the story, has disputed the allegations. Fox told investors on Wednesday that setting aside money for the deal remains a priority, noting that the company has already received necessary approvals in Europe. A wider review could push back approval to the end of June 2018, the firm said. 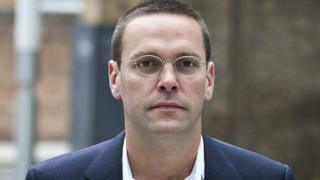 “We remain confident our transaction will be approved, but more likely in the first half of 2018 than before the end of this calendar year,” said James Murdoch, chief executive of 21st Century Fox. Mr Murdoch made the comments to analysts as the company released its latest earnings. He is also chairman of Sky News. Over the 12 months to the end of June, Fox made $3bn in profit for shareholders, with revenues growing by 4% to $28.5bn. The firm’s revenue in the fourth quarter increased 1.5% to $6.7bn, powered by growth in its cable division, which includes Fox News and the FX channel. But profits in the quarter contracted, as the company struggled to keep audiences at its broadcast television division and for its movies. The firm reported $476m in shareholder profits for the quarter, down more than 12%. Fox, like other media companies, is grappling with the way the internet and on-demand video has changed media consumption, with audiences increasingly going online. Disney on Tuesday said it would invest in its own streaming sites and end a distribution deal with Netflix. Fox said the changes are reinforcing its focus on news and sports, which are more likely to be watched in real time. The firm is also exploring new distribution options. It has announced an ad-free offering with Comcast, expanded its partnership with Hulu and is exploring its own apps.